Evaluating the effects of the proposed design layout, including any potentially damaging activities to trees such as changes in ground levels, the type and depth of foundations, access road and pavement layout in relation to retained trees. The arboricultural impact assessment clearly identifies the trees for retention and removal. 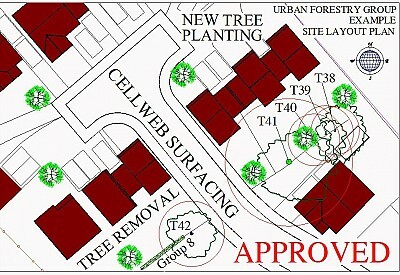 Trees that require pruning for safety, re-shaping to allow unrestricted access within the site, pruning over pavements, roads, lighting columns, general thinning and pruning back from buildings and sub structures are clearly identified in the assessment, with accompanying and detailed tree works specifications. Where construction is required within tree root protection areas, we assess this and provide detailed specifications for tree root pruning and / or tree root protection. We work with your architect to consider any special measures designed to protect tree roots, such as foundation piling layouts, soil compaction ground protection and load bearing materials for use in access roads to reduce excavation depths within tree root protection areas. As part of the arboricultural impact assessment your ‘BS 5837 tree survey’ site plan includes a detailed and clearly marked tree protection plan, specifying the positions and type of tree protective fencing. We also provide a tree protection plan both to scale on your ‘BS 5837 tree survey’ site plan and within the arboricultural impact assessment specifying the position and type of tree protective fencing. The arboricultural impact of the proposed site layout plan is now documented with any arboricultural constraints clearly identified including the recommended control measures. To support your application; the impact of any proposed tree removal can be mitigated by providing outline tree replanting proposals. To satisfy planning conditions we also provide detailed landscape design plans for local authority approval with a 100% success rate. To produce your ‘BS 5837 arboricultural impact assessment’; we provide a set of online site specific development questions, enabling you to easily provide specific answers: e.g. the layout of services such as gas, electricity and water. This is quickly submitted to us online, we then send you the ‘BS 5837 arboricultural impact assessment’ draft copy to finalise any minor revisions for your approval.